October 8, 2012 - Aeronautics engineer Richard T. Whitcomb, whose legendary NASA research contributions made supersonic flight practical, joined other aerospace pioneers in the National Aviation Hall of Fame on Saturday. The National Aviation Hall of Fame, located at the National Museum of the United States Air Force in Dayton, Ohio, is dedicated to honoring individuals who have contributed uniquely to America's rich legacy of aviation achievement. In the past 50 years, it has inducted more than 200 of the nation's premier air and space pioneers, including the Wright brothers, Amelia Earhart, Charles Lindbergh and astronauts John Glenn, Neil Armstrong, and others. Whitcomb, who died in 2009 at age 88, may not be as much of a household name as others in the Hall of Fame, but aerospace professionals say his role in aeronautics research is virtually unmatched. "During his almost four decades of federal service, Whitcomb's fundamental insight into aerodynamics and his practical solutions led to three of the most significant and practical contributions to aeronautics in the 20th century," said Lesa Roe, director of NASA's Langley Research Center in Hampton, Va. Those three contributions include the area rule, supercritical wing, and winglets. Whitcomb spent his 37-year career at Langley, arriving fresh out of college in 1943. Nine years later in 1952, the young aeronautics engineer discovered and experimentally verified a revolutionary aircraft design principle that became known as the area rule. Whitcomb discovered if he narrowed the fuselage of a transonic airplane so it is shaped more like an old-fashioned soda bottle, he could reduce its drag and increase its speed without adding power. The area rule has been applied to almost every U.S. supersonic aircraft designed. The achievement earned Whitcomb the prestigious 1954 Collier Trophy for the most important aeronautical advance of the year. Whitcomb's supercritical wing revolutionized the design of jet liners in the 1960s. The key was the development of a swept-back wing airfoil that delayed the onset of increased drag, increasing the fuel efficiency of aircraft flying close to the speed of sound. In the 1970s Whitcomb came up with winglets, wingtip devices that reduce yet another type of drag and further improve aerodynamic efficiency. Many aircraft currently sport wingtips that are angled up for better fuel performance. 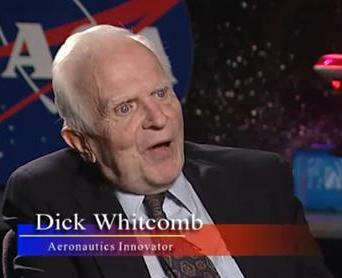 Whitcomb received the National Medal of Science from President Richard Nixon in 1973, the U.S. Air Force Exceptional Service medal in 1955, the first National Advisory Committee for Aeronautics' (NASA's predecessor) Distinguished Service Medal in 1956, the NASA Exceptional Scientific Achievement Medal in 1959 and the National Aeronautics Association's Wright Brothers Memorial Trophy in 1974. The engineer also was inducted into the National Inventors' Hall of Fame in 2003, the National Academy of Engineering in 1976 for his pioneering research in the aerodynamic design of high performance aircraft, and the Paul E. Garber First Flight Shrine at the Wright Brothers National Memorial in North Carolina. Whitcomb's alma mater, Worcester Polytechnic Institute in Massachusetts, awarded him an honorary doctorate and its presidential medal. Being inducted into the National Aviation Hall of Fame along with Whitcome are well-known aviation artist Keith Ferris, female aviation pioneer Geraldine Cobb, and the late Elwood Quesada, an Air Force general and pilot who in 1929 helped develop and demonstrate air-to-air refueling and was the first commander of the USAF Tactical Air Command and the first head of the Federal Aviation Administration. The ceremonies will held at the Dayton Convention Center in Dayton, Ohio.